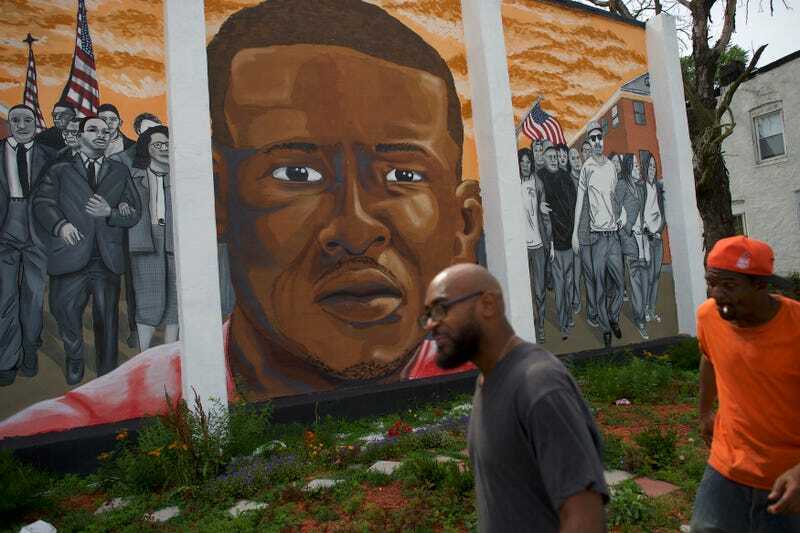 People walk past a mural of Freddie Gray on June 23, 2016, in Baltimore. Prosecutors have decided to drop the charges against the remaining Baltimore police officers in connection with the 2015 death of Freddie Gray, the Associated Press reports. Of the six officers charged in the case, three were acquitted by a Baltimore judge in a bench trial, while a mistrial was declared in the trial of a fourth officer after the jury deadlocked. Prosecutors had been arguing that Gray was illegally arrested back in April 2015 after he ran away from a bike-patrol officer. Officers then failed to secure Gray with a seat belt in the police van, or call a medic after Gray insisted on going to the hospital. Gray ultimately died after suffering a serious spinal injury while in custody. As NPR notes, as pretrial motions for Garrett Miller, the next officer who had been due to stand trial, started, the Maryland court issued a statement saying that the Baltimore City State's Attorney's Office had "decided not to prosecute the remaining cases related to the arrest and death of Freddie Gray."